Come one, come all and be mesmerized with a night full of fun, mystery and excitement. Come and witness who will win Ambassador’s title for Project Echo. Vote for this season’s winner for UCSI University’s Got Talent 2. There would be also Tarot Card Reading section where you can test your luck, foresee your future and also seek your love mate. In addition, there would also be a Magic Show where you can be dazzled with the world of magic. 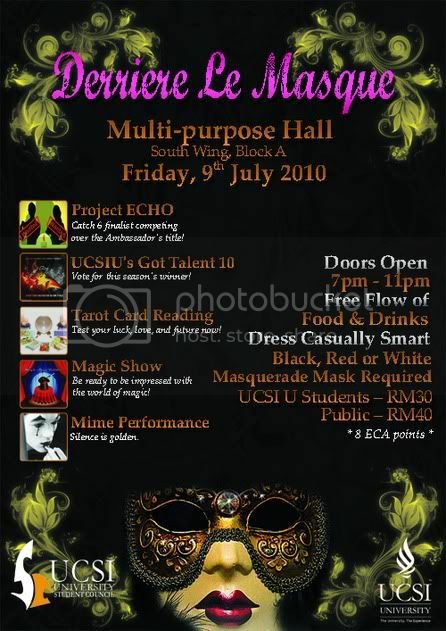 For those who appreciate the value of silence, come and be impressed with our Mime Performance where silence is golden. Contact Jackie: 016-6317072 to get your tic now!